My first magazine subscriptions were to Ranger Rick and Sports Illustrated For Kids. I read them cover to cover, every month. Now, between me and my wife, who is also a magazine editor, we have more publications arriving in the mailbox than we can possibly keep up with. We can&apos;t help it. So much technology has changed since those mags first started arriving at my childhood home, but digital media can&apos;t touch the experience of receiving a beautiful, coffee-table-worthy product full of compelling stories, stunning photography, and fun surprises every month. In a world full of things, a magazine is an experience that offers knowledge, laughs, inspiration, and news. That&apos;s what we try to deliver here at New Mexico Magazine. We want to share stories of quality and depth that you can&apos;t find anywhere else. And we want to entertain you and tell you all about our favorite recipes, restaurants, bars, and trends. More than anything else, though, we want to share our love of New Mexico. Our January 2019 issue ushers in the magazine&apos;s 98th year. We are dependent on readers like you to keep this award-winning publication going. 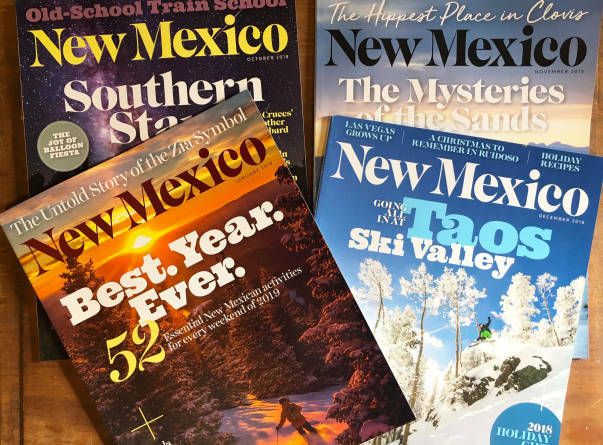 So give the gift of New Mexico pride this holiday season with a subscription to our magazine and share along in this journey. Subscribe today and we&apos;ll deliver the magazine right to your door for just over $2 an issue.